For most of human history, where you worked dictated where you lived, and where you lived limited the type of work you did. Not anymore. 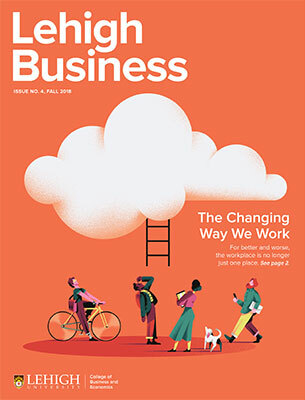 This annual edition of Lehigh Business examines in-depth the changing way we work, for better and worse. The issue also highlights the College of Business and Economics' planned expansion, faculty's ground-breaking research and student and alumni endeavors around the globe. Suzanne Daugherty ’86 is the first woman, and longest serving, CFO at PJM Interconnection, which operates the high-voltage electric power system in all or parts of 13 states and Washington, D.C. The successful entrepreneur has put his support behind "Drop in the Bucket" nonprofit. Students in the College of Business and Economics are among the 2018 Leonard P. Pool Memorial Prize winners.